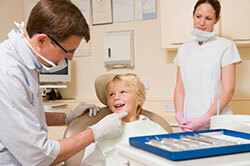 Our practice is dedicated to the prevention of dental disease through patient, parent, and community education. The child and adolescent is our primary focus. Each patient, parent and dental team member is to be treated with respect, care and open communication. We strive for perfection in our delivery of Pediatric Dentistry and Orthodontics. We pledge the practice to the highest standards of quality possible. Our goal is to develop a patient who is free of dental disease, orthodontically correct; who feels good about themselves, and remembers his/her early dental care with affection and no anxiety.